A witness to the police killing of 18-year-old Mike Brown over the weekend in Ferguson, Missouri, will meet shortly with the FBI, his lawyer says. Dorian Johnson’s lawyer told MSNBC that he was initially refused an interview by police even though he was walking with Brown when the fatal shooting occurred. Johnson, 22, will be speaking with the FBI and the St. Louis County prosecutor later Wednesday, the Washington Post's Wesley Lowery reported Wednesday. The meetings come after Johnson’s lawyer Freeman Bosley said police had yet to interview the witness, even after Bosley attempted to set up a talk with them. Johnson was walking with Brown on Saturday afternoon when the fatal shooting occurred in the mostly black St. Louis suburb of Ferguson. In an interview with St. Louis’ KSDK, Johnson said police shot his friend "like an animal" as he held his hands in the air. He also told the station that Brown never attempted to take the officer’s weapon. "It was around 1:40, two o'clock. We were walking down the street, empty street. We were just walking down, minding our business. We're both headed home, and the officer's approaching us, and as he pulled up on the side of us, he didn't say 'freeze,' 'halt,' or nothing like we were committing a crime. He said, 'Get the f--- on the sidewalk!' I told the officer we were not but a minute away from the destination,” Johnson said. Johnson said the officer then opened his car door, grabbed Brown’s neck and attempted to pull him through the window of the police car. He added that Brown “never once attempted to grab for the officer's weapon." "The second time he says, 'I'll shoot,' a second later the gun went off and he let go. That's how we were able to run at the same time," Johnson said. He said he ran behind a car while the officer fired at them, shooting Brown in the back. Johnson continued, "[Brown’s] hands immediately went into the air and he turned around to the officer. My friend started to tell the officer that he was unarmed and that he could stop shooting. Before he could get his second sentence out, the officer fired several more shots into his head and chest area. He fell dramatically into the fatal position. I did not hear once he yell 'freeze,' 'stop' or 'halt.' It was just horrible to watch." Brown’s death has sparked three consecutive nights of protests in Ferguson and outrage across the nation as people question the officer’s use of force. Police say the officer shot Brown because the teen attempted to grab his gun. However, they haven’t confirmed witnesses claims that the teen’s hands were in the air when he was shot. The officer who shot Brown has not yet been identified. Ferguson Police Chief Thomas Jackson announced on Tuesday he wouldn’t be revealing the officer's identity, though he initially said he would give the officer’s name. He cited the man’s safety as his reason for not fulfilling his promise to identify him. "If we come out and say, 'it was this officer,' then he immediately becomes a target. We're taking the threats seriously,” Jackson said. At another news conference on Wednesday afternoon, the chief said he had been working to increase diversity within his department and that "race relations is a top priority" for the Ferguson police now. But he again refused to identify the officer. 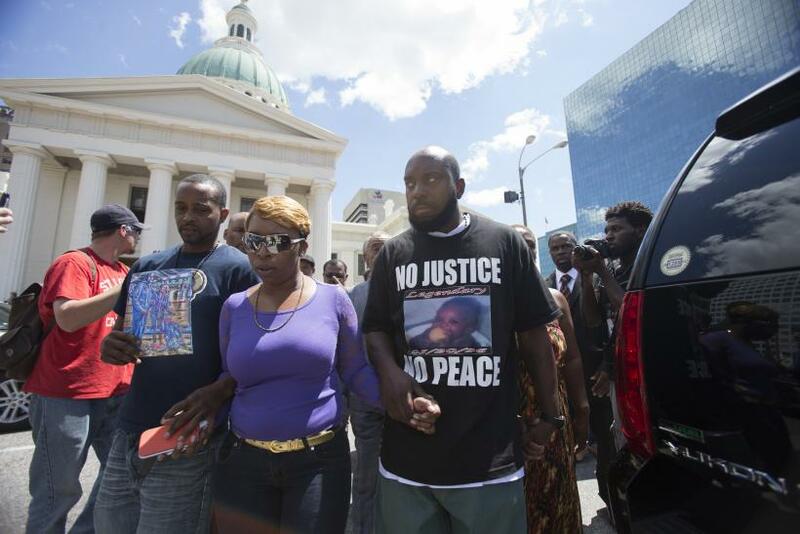 Jackson also said he would meet with Brown's family and community leaders Thursday. At a news conference Tuesday outside the Old Courthouse in downtown St. Louis, the Rev. Al Sharpton, who came in from New York, said Brown’s family wants people to control their anger and find peaceful ways to protest the killing. Late Wednesday afternoon, marchers were again gathering in Ferguson, behind banners reading, "Love Peace & Prayer Equals Non Violence. RIP Michael Brown."